Wait! 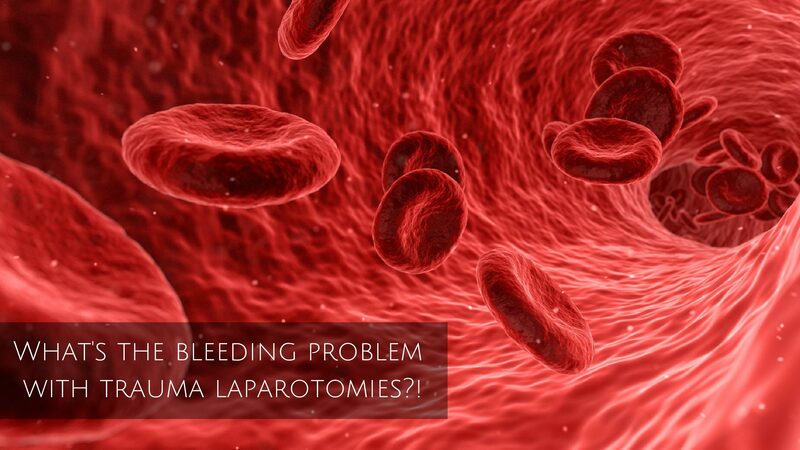 We’re emergency physicians, why do we care about laparotomies?! Sure, at face value this would appear to have a rather surgical slant to it, but I hope by the end you share my feeling that, as emergency and critical care physicians, this is absolutely in our sphere of concern. I like simple questions and this couldn’t be more straightforward. If we mess about performing interventions, take our foot of the gas with the urgency of the clinical trajectory, or simply just don’t have quick way of getting to theatre, are we harming patients? I also LOVE the fact that the introduction to their paper is only 64 words long. The paper was based on the data from 243 patients from 1986-1999. They looked at SBP on admission to the ED, the length of time spent in ED, and the clinical outcome and plugged the numbers into a logistic regression model. If you were hypotensive, time spent in the ED was associated with increased mortality up to 90 minutes. In fact, the probability of death increased approximately 1% for each 3 minutes in the ED. That relationship held true up to 90 minutes after which, survival improved again. Potentially those surviving without intervention beyond 90 minutes represent a survival bias and didn’t need emergent intervention. The headline for me was the 40% mortality rate in hypotensive trauma patients that rapidly require a laparotomy. If you want to read the paper in full check it out here. Fast forward to 2017 and John Harvin et al. co-ordinated a study across 12 Level-1 US trauma centres. This time the authors bulked up the introduction to a hefty 140 words. The premise was simple; the mortality 20 years ago or so was 40%, but since then we’ve introduced pre-hospital care and learnt a load about damage control resuscitation and surgery so mortality should be waaaaay lower. Well. Not quite. They looked at 1706 trauma patients who underwent laparotomy within 90 minutes of arrival to the ED and compared hypotensive (n=394) to non-hypotensive patients (n=1253). This time the mortality in the hypotensive group was 46%! Well, myself and some colleagues read this, promptly puffed out our chests and thought ‘well we must be better than that’. So we copied them. We took exactly the same definitions and cut offs and repeated their methodology in our own group of patients. We looked at a military cohort from Camp Bastion (which we will park for now, as a slightly different, but important cohort) and from a Level 1 MTC in the UK. Quelle surprise…..our mortality in hypotensive trauma patients undergoing laparotomy within 90 minutes of arrival was 47.6%!! (We also had the longest introduction at 276 words). So what the hell is going on?! We’ve got better pre-hospital care then we’ve ever had, we have better transfusion practices, we have tranexamic acid, we have trauma networks, we do damage control surgery. So how is it that we have (at best) the same mortality as 20 years ago, if not worse?! Now I know everyone will be thinking ‘we take more to IR, so only the sickest go for a laparotomy’, and ‘HEMS just bring sicker patients to hospital more quickly’, but the numbers don’t reflect that. We have comparable ISS (Injury Severity Score) and AIS (Abbreviated Injury Score) scores to those 20 years ago, and pre-hospital time and pre-hospital care did not be a factor. The immediate chain of care for these patients involves pre-hospital clinicians, ED clinicians, surgeons, anaesthetic clinicians, and ITU clinicians. Are pre-hospital teams spending too long on scene? Are EM trauma teams taking too long to make a decision? Are anaesthesia correcting physiology? Are unstable patients going to CT rather than having their bleeding controlled? Do surgeons just play lip service to DCS and infact perform 5 hour long initial operations? Are ITU staff giving too much crystalloid? Probably doubtful, but there is no data to explore this. So, the questions I put to you are thus. ‘Do we actually practice damage control resuscitation?’ and ‘do we actually practice damage control surgery?’. As a recap, damage control resuscitation (DCR) is conceptualised as the triad of haemostatic resuscitation, permissive hypotension, and damage control surgery. Damage control surgery is an concept stolen from the Navy, and the origins describe the hasty repairs performed to a ship in conflict to make it seaworthy enough to get to a place of safety for definitive repair. This translates into physiological, and not necessarily anatomical surgery; stop the bleeding, remove the contamination, relocate the fractures and get to ITU. Once on ITU treatment aims to normalise physiology to a point where the patient can tolerate definitive surgery. I don’t know the answers to my questions, and I’m not 100% sure anyone does. Inevitably practice will vary from MTC to MTC, from MTC to TU, and from TU to TU (major trauma centre, trauma unit; Level 1 and 2 equivalents respectively). We have some absolutely world-class data registries in the UK, yet neither the National Emergency Laparotomy Audit (excludes trauma) or the Trauma Audit & Research Network capture the data to answer these questions (NELA excludes trauma). TARN would be the best bet, yet doesn’t quite have the granularity of physiological data, or capture the decision process in enough detail to accurately determine whether DCR was employed or not, and I don’t like assuming that all hypotensive trauma patients receive DCR. Earlier this year a National Trauma Research and Innovation Collaborative (NaTRIC) was set up to utilise the passion and enthusiasm for improving trauma care across the UK. NaTRIC is not speciality specific, nor is it profession specific; anyone interested in trauma care can get involved. On the 1stof January NaTRIC will launch its first ever project, TELA (Trauma Emergency Laparotomy Audit). TELA is setting out to audit how the UK treats hypotensive trauma patients requiring laparotomy. So far, we have every MTC in England, Scotland, and Wales signed up, several TUs, and 100 collaborators. TELA hopes to answer the questions I posed earlier. If you are interested, check out some more information here, otherwise watch and wait! P.S. A cheeky plug for NaTRIC – we are having our next meeting in Coventry on the 8thof February, it’s free and you can get tickets here. If you have an idea for a trauma research project, please get in touch!